Do You Need Your Toilet Repaired? 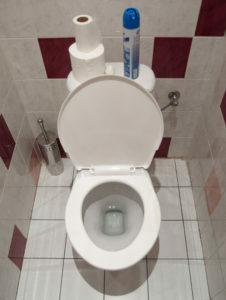 The toilet never seems important to a homeowner until it suddenly doesn’t work or appears to be malfunctioning. Even little things like an old wax seal (piece that connects toilet foundation to the floor)can slowly lead to bigger problems as water will leak every time the toilet is flushed. Call us today at Streamline Plumbing if you need us to come check out the problem. Clogged toilets (or blocked toilets)are common problems for homeowners that need to be addressed immediately. Even a simple clogged toilet (that can’t be fixed with a plunger)can become a serious plumbing issue if the clog isn’t fixed. Call Streamline Plumbing if you just need our snaking service to unclog the toilet, check your pipes for any potential blockage, or etc. Condensation or “sweaty tank” can occur when steam from your shower causes the toilet bowl to drip. Basically this happens because oxygen that is hotter than the temperature of the water – in the toilet bowl – exists in the room causing condensation on the toilet. It might seem like a harmless little thing, but left unattended, a “sweaty toilet” can become a hot spot for fungus to grow. Don’t wait for these little problems to become a Big problem. At some point all homeowners have had to face a clogged toilet. Many times a clogged toilet can just be fixed by using a plunger and being careful about what is flushed down the toilet. Of course you don’t want your toilet to overflow or potentially flood your bathroom, so if you have a clog you can’t fix then contact us at Streamline Plumbing today for immediate help. Unfortunately a household plunger won’t always work, but Streamline can fix any bad toilet clog, so call us anytime. Any water leak is Never a good thing, and even the smallest leak can become a disaster for a homeowner. Sometimes just simply changing the rubber flapper valve inside the tank can fix the problem, but if you are not sure and want a professional to solve the issue please contact us today. Of course the major concern is water leaking and causing damage somewhere else in your house, but in the meantime your water bill will increase if your toilet is constantly running. Call Streamline today for a water leak detection and we can make a quick repair. Streamline Plumbing technicians are highly trained and can fix any toilet / plumbing problem. If you need a new toilet installed we can do that at a very affordable price. Our experienced plumbers offer total installation services and we can install low-flow toilets that are much more efficient than the older toilets. Sometimes toilets just get old and need to be replaced. So regardless of the new toilet you want installed, just call us today for a Free estimate and we’ll get your new toilet installed today.